Chhabra A, Ring AM, Weiskopf K, Schnorr PJ, Gordon S, Le AC, Kwon HS, Ring NG, Volkmer J, Ho PY, Tseng S, Weissman IL, Shizuru JA. Haematopoietic stem cell transplantation in immunocompetent hosts without radiation or chemotherapy. Sci Transl Med. 2016; 8(351):351ra105. 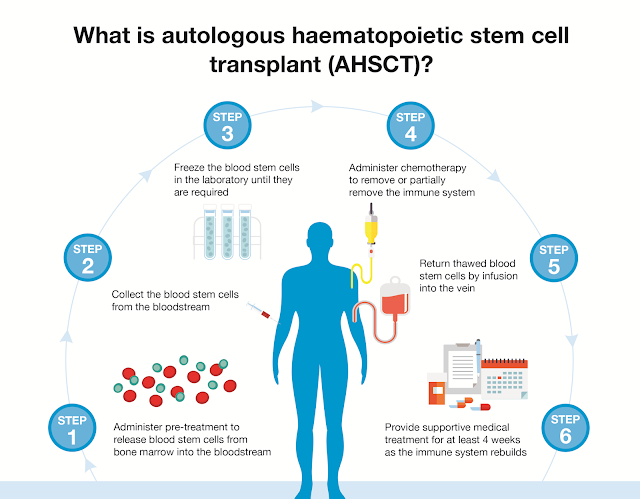 Haematopoietic stem cell (HSC) transplantation can cure diverse diseases of the blood system, including haematologic malignancies, anemias, and autoimmune disorders. However, patients must undergo toxic conditioning regimens that use chemotherapy and/or radiation to eliminate host HSCs and enable donor HSC engraftment. Previous studies have shown that anti-c-Kit monoclonal antibodies deplete HSCs from bone marrow niches, allowing donor HSC engraftment in immunodeficient mice. We show that host HSC clearance is dependent on Fc-mediated antibody effector functions, and enhancing effector activity through blockade of CD47, a myeloid-specific immune checkpoint, extends anti-c-Kit conditioning to fully immunocompetent mice. The combined treatment leads to elimination of >99% of host HSCs and robust multilineage blood reconstitution after HSC transplantation. This targeted conditioning regimen that uses only biologic agents has the potential to transform the practice of HSC transplantation and enable its use in a wider spectrum of patients. 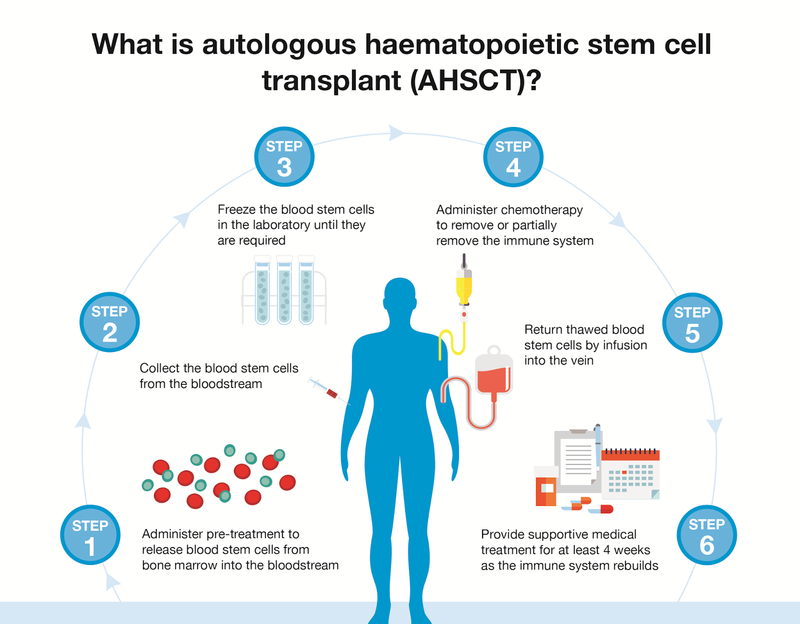 There is much interest in Haematopoeitic stem cell therapy (HSCT…yes the T means transplantation to some but others argue it is not a transplant as you are using your own cells…yadda yadda yadda), which is arguably the most potent immune modulator available. It’s level of efficacy of myoablative HSCT appears superior to the results of any current MS, but this is not surprising as it is obliterating your immune system and replacing it with a new one. However, in doing so the chemotherapy, agents removes all your current defense against infection and so the real risk of this procedure is that you can have a lethal infection. This “cure of the week” in mice reports on a way of clearing out the stem cells from the bone marrow and allowing you to replace them. This has prompted many MS websites to shout loud we can now do HSCT without chemotherapy agents and with no risk of infection so sign me up I see a load of you say. So what is this wonder treatment? Mast/stem cell growth factor receptor (SCFR), also known as proto-oncogene c-Kit or tyrosine-protein kinase Kit or CD117, is a receptor tyrosine kinase protein. Haematopoietic stem cells (HSC), multipotent progenitors (MPP), and common myeloid progenitors (CMP) express high levels of CD117. Common lymphoid progenitors (CLP) express low surface levels of CD117. CD117 also identifies the earliest thymocyte progenitors in the thymus. It is also a marker for mouse prostate stem cells. In addition, mast cells, melanocytes in the skin, and interstitial cells of Cajal in the digestive tract express CD117. CD117 is a cytokine receptor expressed on the surface of haematopoietic stem cells as well as other cell types. CD117 is a receptor tyrosine kinase type III, which binds to stem cell factor (a substance that causes certain types of cells to grow), also known as “steel factor” or “c-kit ligand”. When this receptor binds to stem cell factor (SCF) it forms a dimer that activates its intrinsic tyrosine kinase activity, that in turn phosphorylates and activates signal transduction molecules that propagate the signal in the cell. Signalling through CD117 plays a role in cell survival, proliferation, and differentiation. Importantly, in this context Haematopoietic progenitor cells are normally present in the blood at low levels. Mobilization is the process by which progenitors are made to migrate from the bone marrow into the bloodstream, thus increasing their numbers in the blood. Mobilization is used clinically as a source of haematopoietic stem cells for haematopoietic stem cell therapy (HSCT). Signaling through CD117 has been implicated in mobilization. At the current time, G-CSF is the main drug used for mobilization . G-CSF indirectly activates CD117. Another drug that does this is cyclophosphamide which is a chemotherapy agent (but there are others) that makes your hair fall out. The stem cells can be removed by macrophages and this function was enhanced by adding another antibody targeting CD47. CD47 (Cluster of Differentiation 47) is partners with membrane integrins and also binds the ligands thrombospondin-1 (TSP-1) and signal-regulatory protein alpha (SIRPα). They can replace the Haematopoeitic stem cells and they can form new immune cells….this is great I hear the MS reports say. However, is it good news for MS? Something that is done for a few pounds can be replaced with something costing a few thousand but that’s progress as it reduces a side effect. However, it is also reducing the side effect of removing MS. This is because part of the main key is that you need the depleting therapy to remove your immune system, that harbors the MS causing cells and unless you get rid of these, your MS doesn’t go. If it doesn’t go why bother with HSCT? That you can replace the immune system allows you to wipe it out with the chemotherapy agent and these are probably the agents that are doing good. Cyclophophamide can get in the brain to destroy immune cells that can’t be touched much with antibodies. In non-myoablative HSCT the chemotherapy is not so aggressive that it does not destroy your bone marrow but it hits the MS and the stem cells are there to more rapidly create cells capable of fighting infection. However, is this approach more effective than current effective agents. ProfG has been suggesting a head to head study. Will this get funded. However, this new approach could be combined with treatments targeting the MS causing cells but this will be some way off. First the approach will have to translated to man, unlikely to be MS in the first instance, and we will see what effects and side-effects occur. Will this approach kill off MS causing cells? It will need to be tried.